This Workshop is designed to complement the Fall Workshop, and help Formula SAE IC, FSAE Electric, and Formula Hybrid teams with their vehicle development and with the events at the competitions. All Formula teams are encouraged to bring their vehicles to discuss challenges and share ideas. 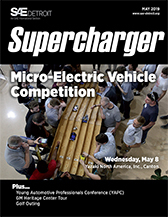 The FSAE Electric teams are especially encouraged to bring their vehicles. Important Note: The Workshop is open to all students. Registration will close February 6 (or when sold out). No onsite registration or refunds after February 6. Times and speakers subject to change. If you would like to sponsor the event, or need more information, email Roxanne Loeffler or call (248) 324-4445 ext. 3.